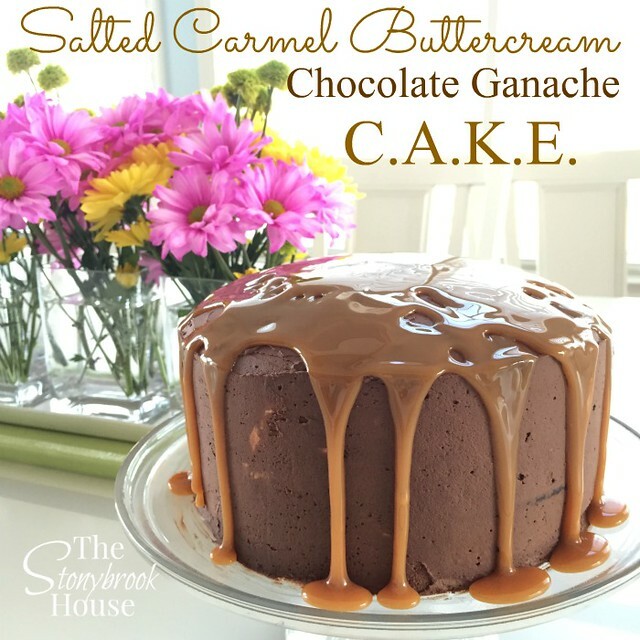 Salted Caramel Buttercream Chocolate Ganache C.A.K.E. The cake part of this recipe was okay, I think it fell short of my Best Chocolate Cake By Scratch recipe, but I really like that hot coffee was added instead of hot water, so I changed that in my recipe here. Also... about Salted Caramel.... My daughter is a stickler for caramel. Soooo, not truly knowing what she would like, I bought one at the store and made the one here. Then we did a taste test. I did it with Hubs too. It was funny, both caramels were the same but different. The homemade one tasted like caramel right from the start and was sweeter. The store bought was sweet but you didn't really taste the caramel til the end. They were both good and I actually used both in the recipe. I preferred the homemade, Hubby couldn't tell the difference, and my daughter liked the store bought. Crazy right?! 1. Heat oven to 350. Grease and flour 3 8-in round pans. 2. Stir together sugar, flour, cocoa,baking powder, baking soda and salt in a large bowl. Add eggs, buttermilk, oil and vanilla; beat on medium speed of mixer for 2 minutes. Then stir in very hot hot coffee. The batter will be extremely thin. Pour batter into pans. 3. Bake 30-35 minutes or until toothpick comes out clean. Cool and remove cakes from pans. 4. Once cool/cold, wrap the cakes in saran wrap and place in the refrigerator overnight. It's much easier to slice in half when the cakes are firm and very cold. 1. Place sugar and water into a deep, heavy-bottomed pot, bring to a boil and cook, swirling the pan. NOT stirring with a spoon, until the sugar dissolves and the color changes to amber. 2. Remove from heat and pour in the heavy cream (be careful as the caramel may bubble and rise up in the pan). Whisk together. When the bubbling stops, add the butter and whisk til combined, mine was not completely smooth, but don't worry it will by the end. 3. Return the pan to a medium heat and cook til a gentle simmer, whisking the whole time until the caramel is smooth and free of lumps. Whisk in salt a little at a time, tasting as you go. BE CAREFUL- the caramel is extremely hot! The saltiness of the caramel is up to you. Just make sure it is well combined and dissolved before you add more. 4. Pour into a glass jar and allow to cool completely. It may be stored in the refrigerator for up to a week. 2. Place over a pan of simmering (not boiling) water. The base of the bowl should not touch the water. Whisk the egg whites and sugar by hand, until the sugar has completely dissolved and the mixture is warm to the touch. If you rub some between your fingers is should be smooth with no graininess, this should take about 5 minutes. Whisk until the egg whites form a thick, glossy bright white meringue. It will take about 10 minutes. Start at a lower speed then work your way up to high. 4. Once the meringue has cooled, switch the mixer to a low speed and begin to add the butter a tablespoon at a time. Make sure that the butter is incorporated throughout before adding more. If your mixture is runny, the butter could've been too soft or the meringue was too warm still, just refrigerate for about 15 minutes and then whip again. 5. Once the buttercream is smooth and silky, whisk in the vanilla and salted caramel. This thickened my mixture immediately and it was ready to spread on the cake. Remove cakes from the fridge and carefully, using a long, sharp serrated knife to slice each cake in half. (Hubby was sweet enough to do that step for me :)) You will have four layers. Place one layer on a plate or cake stand and spread about a quarter of the buttercream. Then drizzle about a tablespoon of the salted caramel over that. (You will need to heat up the caramel, but not too much you don't want it to melt the buttercream.) Continue to do the same with the rest of the layers. What ever you have left spread it all over the cake as a crumb coat. Then place the cake in the fridge while you make the ganache. 2. Pour the cream into a small saucepan and heat til just simmering, and pour over chocolate pieces. All the pieces should be covered with cream. 3. Let it sit for 5-10 minutes, then stir until smooth. 5. Spread ganache all over cake, you will need to work pretty quick. It doesn't take long for it to set. I am obsessed with salted caramel, and this looks AMAZING! And so pretty - can't wait to try it. Hi Julie!! I know right?? What's not to be obsessed by??? Every bite was to die for... :) Thanks for stopping by!! Yum! Will have to make one of these. Anything with salted caramel is tempting to me. Hi Sarah! Oh, you will definitely have to try this one! In fact, I think its time for me to make another! :) Thanks for stopping by!! Wow! Definitely only for a special occasion! Pinning just in case I need something so special. It sounds delicious. And no, I do not want to know the calories or fat content! Hi AnnMarie! Yes, a special occasion...I couldn't possibly have this around often... Every bite is to die for!! Thanks for stopping by!! Oh yum! This looks insanely delicious!